Limericks Bill reads three news-related limericks: The Power of Eating; Mean Girls; Cubicle Hamsters. Bill reads three news-related limericks: The Power of Eating; Mean Girls; Cubicle Hamsters. Come up, it's Lightning Fill In The Blank, but first it's the game where of course you have to listen for the rhyme. If you'd like to play any of our games on air, call or leave a message at 1-888-WAIT-WAIT. 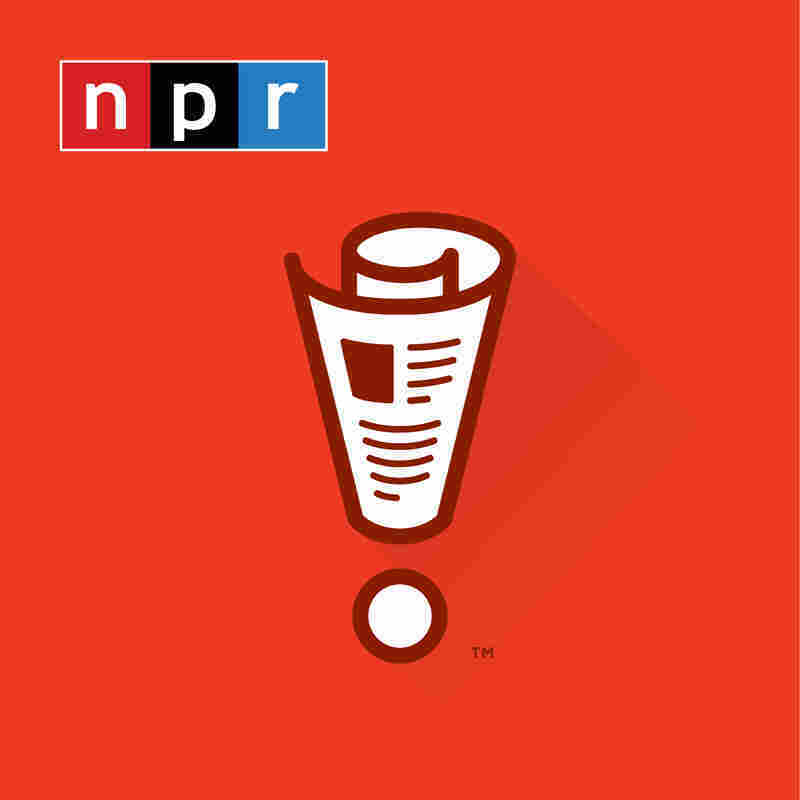 That's 1-888-924-8924, or you can click the contact us link at our website, which is waitwait.npr.org. There you can find out about attending our weekly live shows right here at the Chase Bank Auditorium in Chicago and our upcoming shows in Pittsburgh on October 16 and Austin, Texas on November 6. And be sure to check out How To Do Everything, our sister podcast. This week, Ian and Mike tell you how to keep your best boys straight from your gaffer. Isn't that a Grindr thing? I don't know what that is. SHELBY FERO: Peter, that's a Hollywood thing. SAGAL: Sorry. Anyway, hi. You're on WAIT WAIT ...DON'T TELL ME. WHITNEY GRAHAM: Hi, this is Whitney Graham from Philadelphia, Pennsylvania. SAGAL: Philadelphia, what do you do there? GRAHAM: I'm a trial attorney. SAGAL: You sound like a fictional character in a new 10 p.m. drama. Whitney Graham, Philadelphia trial attorney. I'm told the trials are not nearly - I haven't been in many, thank goodness - so far - I'm told that they're not nearly as interesting as they appear to be on TV, where it's real exaggerated for theatrical effect. Is that the case? GRAHAM: I would say that's true. And on TV, they're usually only an hour-long. SAGAL: You're saying in real life, they grind on for days? GRAHAM: Oh, yes, they can. SAGAL: Well, Whitney, welcome to the show. Bill Kurtis is now going to perform for you three news-related limericks with the last word or phrase missing from each. If you can fill in that last word or phrase correctly in two of the limericks, you'll be a winner. Are you ready to try this? BILL KURTIS, BYLINE: When I chew or talk or I grin, there's a charger my motions will spin. With every small bite I turn on a light, I power my home with my? SAGAL: A group of Canadian researchers have designed a chin strap that turns the motion of chewing into energy, which we can use to power our cars to go get more food. SAGAL: It's a perfect system. The more you eat, the more energy you create. It takes advantage of the one kind of physical activity we still do. TOM BODETT: Yeah, you know, the more I think about that - you know, like, my late Aunt Marie could've lit up Little Rock. SAGAL: Do you want to stay fit and drive home the meaninglessness of your existence at the same time? Try the new human hamster wheel desk. It's designed by two San Francisco inventors who gave shape to their self-loathing by creating a giant hamster wheel you run on while working. And you say, well, great, but how do I get off it to go use the restroom or something? No worries. It comes with a space underneath to put old newspapers and sawdust. FERO: Also, what about when they accidentally go down the stairs? BODETT: That would be great. SAGAL: You know, you're in your office and these enormous plastic hamster balls with accountants inside them come coming by. Hey, Bob - bonk. BODETT: That's a great idea though. SAGAL: Here's your last limerick. GRAHAM: Can I get a hint? SAGAL: Well, it rhymes with dump me, jumpy, not moody, how about - should I just give it to you? SAGAL: A new British Health Survey has found the average woman spends 10 days of every year being grumpy. And if you'd like that number to stay at 10, do not act surprised by how few days that seems. SAGAL: The number was nine until somebody started going up to women and asking them to participate in yet another British Health Survey. Bill, how did Whitney do on our quiz? KURTIS: Well, Whitney is never grumpy, that's why she missed that third. But she got two out of three and that's a win. GRAHAM: Thank you so much. OSCAR: I sing a grouchy song, it makes me feel so bleck. I sing it all day long, 'til I feel completely yuck. I sing a grouchy song, it makes me feel so bad, that when I sing my grouchy song I'm glad.